New technology that can wirelessly resynchronize the chambers of the heart is making its way toward U.S.-based clinical trials in early 2017. EBR Systems’ WiSE technology is an endocardial pacing system for cardiac resynchronization therapy (CRT), designed to address flaws in conventional CRT systems that are ineffective in one-third of eligible heart failure (HF) patients. While standard pacemakers can correct an irregular heartbeat, CRT devices are responsible for making sure the entire heart beats synchronously. In traditional CRT systems, a small pacemaker is placed inside the heart, with leads connecting it to the right atrium, right ventricle, and the left ventricle. Because of difficulties accessing tissue inside the left ventricle and risks of blood clotting, the third lead is typically placed on the outside of the heart, which is inefficient for natural heart pacing. Also, limitations in where the lead can be successfully placed affect the therapy’s success rate, according to a study published in the Journal of the American College of Cardiology. 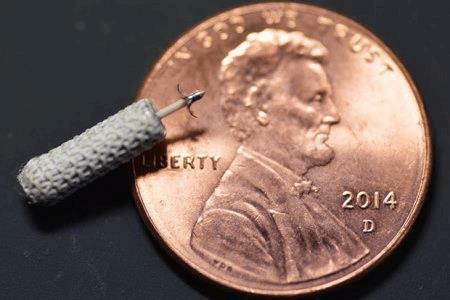 The Wireless Stimulation Endocardially System (WiSE) developed by EBR Systems opens up additional placement possibilities because the device — which is approximately the size of a grain of rice — does not require a lead. Instead, the implant can be inserted directly into the left ventricle, where its polyester scaffolding quickly grows over with cardiac cells, integrating the device into the heart muscle. A separate ultrasonic transmitter is placed between the ribs to communicate with pacing in the right and left chambers of the heart to synchronize beating within 5 milliseconds. Because the implant is powered with piezoelectric elements, it will never require a battery replacement — the device is powered by mechanical stress harvested from the heart’s own beating. A recent European study tested the WiSE system in 39 patients who had not responded to traditional CRT devices and found that 85 percent of participants improved after six months. The system received a CE Mark in October. In March, EBR systems announced the first successful commercial implants of WiSE technology had taken place in the UK and Czech Republic. Researchers are currently working to design a clinical study to test the technology in the U.S. and aim to begin the study in the early part of 2017, reported IEEE Spectrum. About 30 percent of patients do not respond to traditional CRT therapy and between 10 and 12 percent experience complications with the left ventricular lead, reported the Star Tribune. Nearly $1 billion out of $3.5 billion spent on CRT provides no benefit for HF patients, said EBR CEO Allan Will. Medtronic and St. Jude — both of whom have introduced wireless versions of a standard pacemaker —recently consulted with the FDA on how best to manage regulatory concerns for leadless pacemakers. A panel convened by the FDA recommended extensive, long-term follow-up of the novel technology.